Date and goji berry cacao balls…. I love a good no bake recipe especially when a sweet treat is involved! 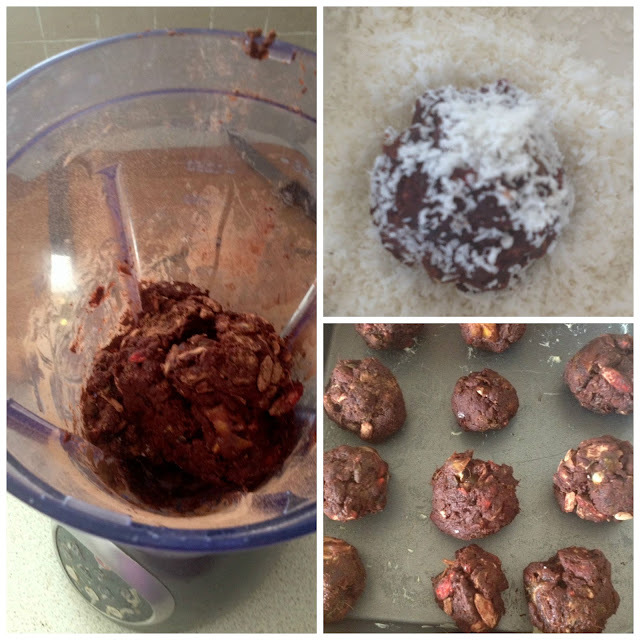 I had a packet of cacao powder in the press and love dates and goji berries, so I combined these with some healthy sunflower and pumpkin seeds to make an energy ball. This is the combination I used…. Soften the dates in boiling water for 5 minutes and put in blender. Add the goji berries and pumpkin/sunflower seed mix and blend until well combined and softened. Sprinkle in the cacao powder and mix again until it completely coats the date and seed mixture. Turn onto a plate and roll into little balls, This amount should make about 12. I put them in the fridge for half an hour then took them out and coated them with the coconut as an added flavour! You can omit this step if you rather them plain. Place them back in the fridge for another hour until well chilled and hardened.